Re-Impact (aka Rendler) is a specialist table tennis blade designer and manufacturer based in Germany. Re-Impact blades offer a number of unique advantages. First and foremost the highest possible degree of ball-control and ‘touch’. The blades are built similar to how musical instruments are manufactured, and one can hear and feel what is harmonically transferred when contact is made with the ball. Even OFF blades offer a blend of both attack and defense which will work for all systems of play. Below is a summary of the technological advantages that Re-Impact blades offer over regular. 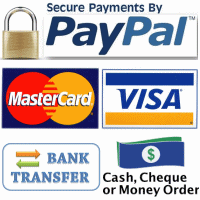 For more detailed information about the technology, please visit our Re-Impact Technology website. When you learn about all the technology and special care in design and manufacturing that goes into every blade, you'll appreciate the value you're getting for your money. Extra catapult with enhanced feel and control - Re-Impact blades generally change the properties of rubbers attached to them as if they were speed-glued. More spin with the right rubbers - these blades also offer a larger potential for producing spin compared to conventional products. When choosing inverted rubbers for your Re-Impact blade, it is recommended to choose a sponge thickness one step lower than normal (e.g. 1.8mm instead of 2.0mm). This is because the extra catapult that most Re-Impact blade offer, enhances the effect of the sponge. The thinner sponge will add further control, so this is an additional benefit. Ultra light weight and much less stress on joints - the singular asymmetrical shape of Re-Impact blades deminishes the air-resistance of the blade, making it far more easy to handle than other blades. Their shape and their special light weight are part of the fundamental design of these blades which intends to unburden the joints of a player’s arm and shoulder.As a special consequence these blades are particularly well suited to players who suffer from limited mobility or reduced muscle strength. The technology also offers great value to players who are no longer as quick on their feet, or as powerful with their shots, and who need more subtle tactics and technique to continue to compete at the same level. Large Sweetspot - Manufacturers often add carbon or other composites to their blades to enlarge the ‘sweetspot’. Nearly all Re-Impact blades have an enlarged sweet-spot similar to carbon-blades; however, they are made of 100% wood, so that the control and dwell time that wood offers is maintained. Re-Impact blades are designed for competition and fully comply with International guidelines for blades, ie. 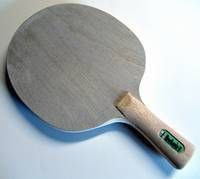 all blades are completely legal under the international rules of the ITTF. High catapult only when you need it - as a result of the balsa, and the special way it's used, the blades feel slow and can take the pace off the ball on soft contact, but are fast and hard contact when you need the power. Re-Impact has a wide range of dual speed blades, where one side has a much lower catapult than the other side. 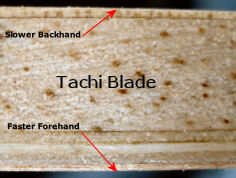 Pictured on the right is the Tachi blade, where you can clearly see the very different construction on one side compared to the other. Re-Impact blade have a unique design that results in a much greater independence between forehand and backhand, and as a result the difference in speed is much greater. Such a large difference between sides, allows for a much more strategic game, where the variation in pace can often win points or setup for an easy put-away. The Tachi is ideally made for pimple rubber with no sponge, but several of the other blades are designed for play with just about every other rubber and style. Instead of blades being mass product, which is the case for almost all brand name blades, the Re-Impact blades are manufactured one by one, by a master craftsman in Germany, so every blade gets the special attention it needs. All this means the price is a little higher than your average 'budget blades' (but still less than many high-end brands which are mass produced), but you get (arguably) the most high-tech blades on the market, and one that's been hand-made in Germany, so you know the extra money is well spend. Why buy Re-Impact blades from OOAK Shop? OOAK shop is the sole distributor for Re-Impact in Australia, and is a trusted specialist table tennis store, and has been in business for more than 10 years, so you can be assured of expert advice and continued support. Since we're players ourselves, and test a lot of our equipment, we understand the needs of players, and can therefore offer the best advice. If you have special requirements for your blade (eg a specific weight) we would be happy to discuss this with you! Since we deal and communicate with Re-Impact directly, you can be assured that the products are genuine, and that they have been stored in acceptable condition and are checked before being shipped. You can browse through find our Range of Re-Impact Blades here in our shop, or you can contact us for advice. OOAK shop carries a wide range of the Re-Impact blades, and any blades that are not in stock can be ordered in for you.